Do you ever fancy a mushroom risotto but don’t fancy the standing and stirring that goes with it? Although I thoroughly enjoy a good stir in the kitchen, there are times when I don’t have the time or really can’t be bothered. 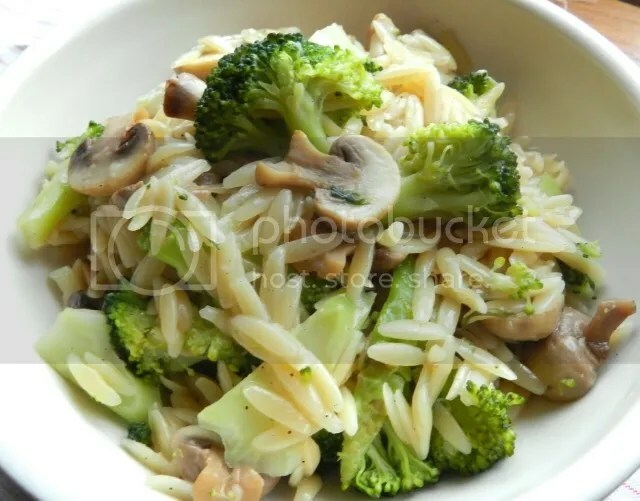 In those situations I reach for orzo pasta – the tiny, rice-grain-shaped ones. It cooks a lot quicker than rice and will give you a lovely bowl of warm comfort in a short time and for very little effort. I have used mushroom stock here – from the Italian porcini stock cubes. They are well worth seeking out, but otherwise vegetable stock and some mushroom ketchup will do the job. This is one place where button mushrooms will do well – they hold themselves together well in the cooking process. I think this tastes good enough on its own, but the cheese lovers can add the veggie parmesan substitute of their choice if they feel like it. Heat a little olive oil in a wide saucepan. Add the garlic and warm through. When you can smell the garlic in the oil add the mushrooms and broccoli. Stir for a couple of minutes and then add the orzo, stock and tarragon. Stir well and bring to the simmer. Simmer, uncovered, for 8 minutes or until the pasta is cooked. If it hasn’t absorbed all the liquid, turn off the heat and let it stand for a couple of minutes and the pasta will take up more of the stock. It’s early spring now, I think. The days are lengthening, the sun is warmer, the birds are singing and the purple sprouting broccoli is in the shops. It’s a pretty thing raw, all long stems, green leaves and florets tinged with purple. But for all it’s delicate appearance it packs the strongest flavour of all the broccolis. That makes it great to match with other punchy flavours. Here I’ve teamed it with garlic, chilli and the dry crunch of walnuts. Served with crusty bread as a starter, it will certainly issue a wake-up call to the palate! Steam the broccoli for between 5 and 10 minutes. It’s ready when the thickest part of the stem can be easily pierced with the point of a knife. In a small pan, warm the olive oil, garlic, chilli and walnuts. You’re not frying the ingredients, just heating them so their flavours come out. A bit of sizzle is OK, but don’t let anything brown. When the broccoli is cooked, remove from the steamer and put on warmed plates. Season the dressing with salt and pepper and stir in the lemon juice. 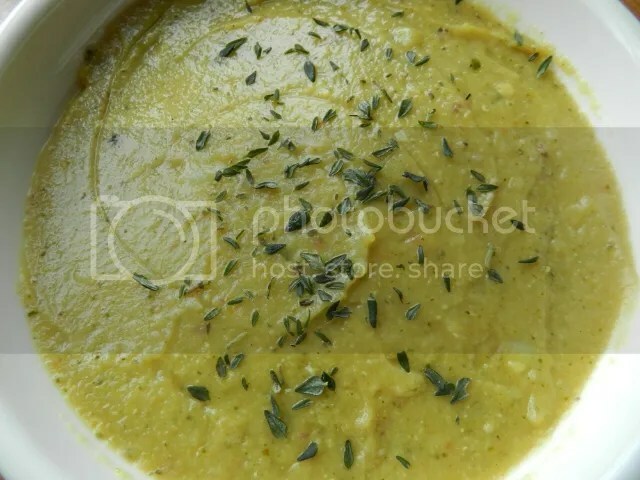 Spoon the dressing over the broccoli and serve. Yes, you read that right – the sauce is definitely the star with this recipe! For what is a simple recipe, this has a bit of complicated origin for me. It all started with a review of Drakes Tabanco by Jay Rayner in The Observer. In it he wished that the restaurant had paired a dish of romesco sauce with something more thrilling than tenderstem broccoli. Well, I disagree. 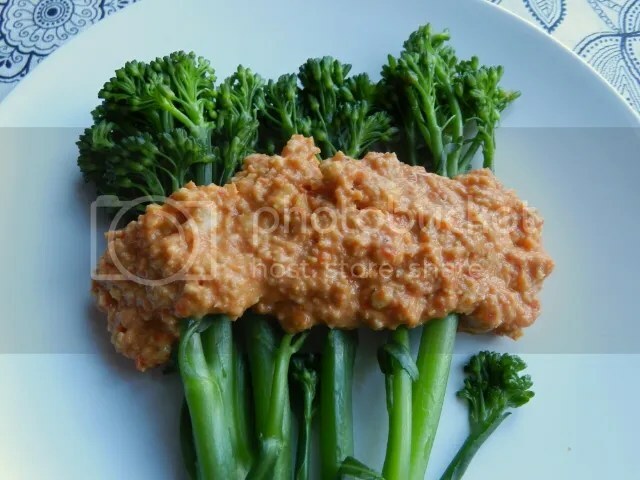 Romesco sauce packs a hefty punch and I think something green and irony is just what is needed to stand up to it. 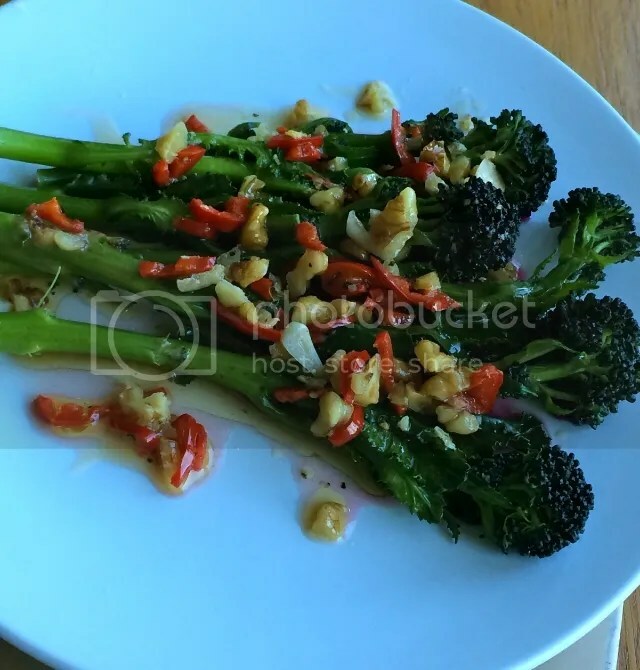 Tenderstem broccoli does just the thing. Broccoli of any type would do, but so would kale, savoy cabbage or spinach. Blanch the greens, stir through the romesco and you have a dish that should be thrilling enough for anyone. I’m sorry, Jay, but we’re not letting the meat-eaters keep this sauce to themselves. And besides – look how pretty it looks! Prettier than any meat you could pair with this. Put the peppers under a hot grill until their skin is blackened on both sides. Remove the skins and seeds. Put the pepper flesh with the rest of the sauce ingredients into a food processor and whizz until you have a smooth paste. Cook the broccoli in plenty of salted water until just tender. Drain the broccoli and serve with the sauce spooned over. I’m a foodie so I should be completely in favour of seasonal food. I am, to a certain extent. I welcome each new arrival, sprouts and the first frost-bitten parsnips in autumn, english strawberries and scottish raspberries in summer, plums in August. And then I get bored with them and want something new. The something new this month is Purple Sprouting Broccoli. It’s thinner and quicker to cook than it’s year-round cousin and it fully deserves to star in its own show. I’m pairing it here with marinated tofu. Don’t worry about the strong flavours, it can stand up to them far more than its delicate frame would suggest. Put the tofu in a bowl and pour over the soy sauce and ginger. Cover, a set aside for at least an hour. Blanch the broccoli in boiling for 3-5 minutes. You want the stalks to be al dente. Drain and rinse in cold water to stop it cooking any further. Mix the soy sauce, sugar, vinegar, ginger, garlic and sesame oil together and toss with the broccoli. Let the broccoli absorb the flavour at room temperature for about half an hour. Drain the tofu from the marinade and put into a hot frying pan with a little oil. When the tofu is browned on all sides, turn the heat down. Add the marinade plus the extra soy, garlic, rice wine and sugar. Heat and stir around the tofu, until the sauce is reduced and sticky. 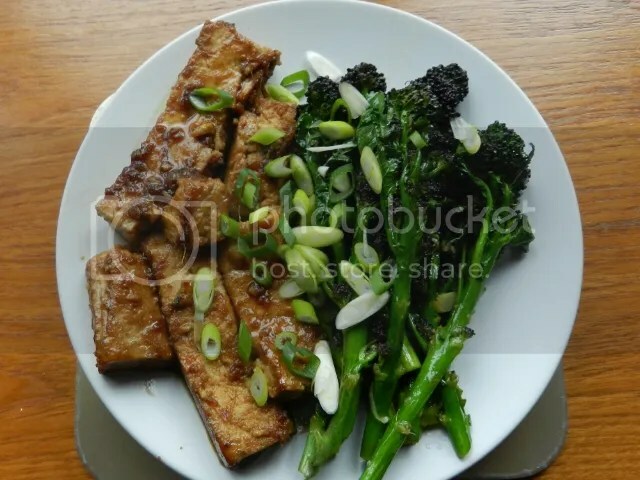 Serve the tofu beside the broccoli salad with the teriyaki sauce spooned over. Sprinkle the sliced spring onion over as a garnish.